we continue with Jesus' Sermon on the Mount begun last Sunday. 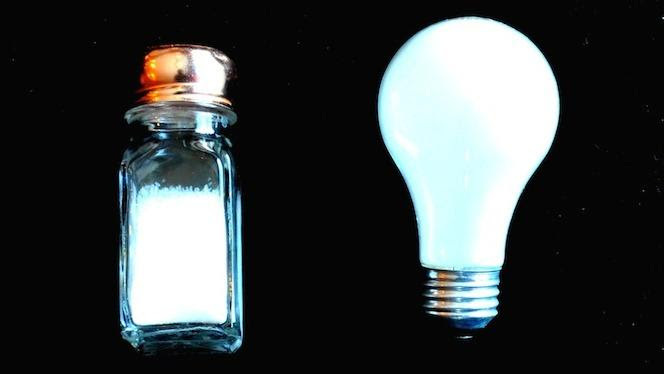 Jesus used the metaphors of salt and light to call his disciples to be difference makers. Jesus said to his disciples: "You are the salt of the earth. But if salt loses its taste, with what can it be seasoned? It is no longer good for anything but to be thrown out and trampled underfoot. You are the light of the world. A city set on a mountain cannot be hidden. Nor do they light a lamp and then put it under a bushel basket; it is set on a lampstand, where it gives light to all in the house. Just so, your light must shine before others, that they may see your good deeds and glorify your heavenly Father." In our first reading (Isaiah 58:7-10), the prophet explained how his readers should be light to the world - with their actions - in caring for the oppressed and the homeless. It would be through their actions that they would receive vindication, by loving one another. Perhaps it was this passage that Jesus had in mind as he taught his disciples this important lesson. Thus says the LORD: Share your bread with the hungry, shelter the oppressed and the homeless; clothe the naked when you see them, and do not turn your back on your own. Then your light shall break forth like the dawn, and your wound shall quickly be healed; your vindication shall go before you, and the glory of the LORD shall be your rear guard. Then you shall call, and the LORD will answer, you shall cry for help, and he will say: Here I am! If you remove from your midst oppression, false accusation and malicious speech; if you bestow your bread on the hungry and satisfy the afflicted; then light shall rise for you in the darkness, and the gloom shall become for you like midday. In our Epistle reading (1 Corinthians 2:1-5), St. Paul cautioned his beloved in the cosmopolitan, metropolitan community of Corinth not to rely on the human wisdom and understanding of their culture, but to rely on the power of God which came to them in humility and weakness.. When I came to you, brothers and sisters, proclaiming the mystery of God, I did not come with sublimity of words or of wisdom. For I resolved to know nothing while I was with you except Jesus Christ, and him crucified. I came to you in weakness and fear and much trembling, and my message and my proclamation were not with persuasive words of wisdom, but with a demonstration of Spirit and power, so that your faith might rest not on human wisdom but on the power of God. Perhaps we learn today that being salt and light are words of action, words of compassion, words of love.